Will road chaos hit visitors? 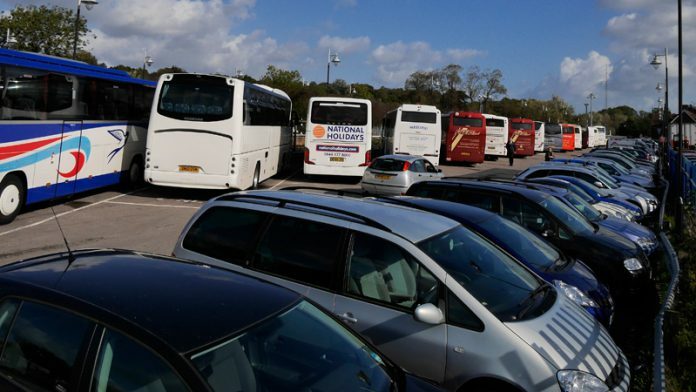 The coaches line up in Rye's station car park, and quite often they are foreign. Rye Town Council approved its budget for the financial year from April 2019 at Monday’s meeting – but a big question mark hangs over whether the books can be balanced. Progress (or lack of it) with Brexit (the UK leaving the European Union) could affect the number of visitors coming to Rye, and therefore income from Town Hall weddings and the Heritage Centre. To date the worst impact is thought to be on Kent’s roads leading to the Channel ports when they again become frontier towns, and roadworks in Kent are already being brought forward, or cancelled (among many other measures). But the Channel Tunnel terminal is much closer to Rye, and Brexit might affect that and surrounding roads as well – as could Kent’s chaos (should it happen). Coach traffic to Rye bringing both UK and foreign visitors, and students (as well as visitors in cars), may therefore decrease (or even cease) affecting both Rye’s and the Town Hall’s income. However the need to also keep an eye on the county council and the district council’s expenditure (and likely rates increase) got some reassurance from East Sussex County Council’s leader Cllr Keith Glazier on Monday. He said they had lobbied long and hard to reduce the cuts they might have to make, and secure more funds, and – while some cuts were still necessary – they were much less now than they had feared they might be. However the amount the police want to increase the number of officers will sharply increase that part of everybody’s rates bill, and whether Rye can balance its books remains uncertain. In a time before the EU. People travelled and the stamp in ones passport took a second longer than the scrutiny required at present because we are not members of the Schengen area. Like the now forgotten millennium bug, project fear is noteworthy only because having been proven wrong on all their predictions its proponents keep on with it always expecting a different result. If there is chaos (apart from that caused by the usual French strikes) it will be because the EU has decided that a sovereign people should be denied food and medicine for daring to disobey. In doing so they will do terrible damage to the livelihoods of people in France, Belgium, Germany and Spain. Maybe, considering the appealing unemployment caused by the fanatical Euro adherents, they are spiteful enough to try. The Esau way may appeal to some, but as any bible scholar will explain, it did not do him much good. So, what else can we blame on Brexit? After all, there will no doubt be famine, pestilence and floods after a March 29th! Let’s all get a grip and realise the world will not stop spinning!